We’d love your help. Let us know what’s wrong with this preview of The Treasure of Maria Mamoun by Michelle Chalfoun. To ask other readers questions about The Treasure of Maria Mamoun, please sign up. Assigned reading for MLIS 7421: Multicultural Youth Literature. I had high hopes for this one, but it was so boring I couldn't wait to get it over with. 3 stars because I feel like a young reader could find a little more enjoyment out of it — no more than that, because as someone who still loves MG fiction, this was not an enjoyable story for me. This book was okay. It was well written with interesting descriptions but, I wanted more adventure. It had a good set up - treasure, Martha's Vinyard, old mansion, sailboat, a boy, a sick patriarch - but then it never really went anywhere. It's nice that Maria became friends with Mr. Ironwall and Paolo, but I never really felt emotionally invested in the characters or the story. I enjoyed the end when they finally (FINALLY!) stole the sailboat but then it was really anticlimactic. Maria Mamoun (for pronunciation's sake, it rhymes with baboon) lives in a difficult neighborhood in the Bronx where she is mercilessly tormented by mean-spirited girls and her mother works multiple jobs to make ends meet. At least, that's how her life has been when this story begins. Then, her mother decides that she is going to take life by the horns and change all of that. She gets a job on Martha's Vineyard caring for an older man that recently suffered a stroke. It's the chance for a fresh start that Maria and her mother need. Maria, who is a bit of a loner to begin with, finds herself in an even more isolated situation. Her mother doesn't start her at the new school with only three weeks to go in the school year, so she ends up spending most of her time on the old man's estate where Maria and her mother now live. She does find a friend in the large dog that the man, Mr. Ironwall, owns and takes on the job of dog walker for him. She also encounters the other caretakers at the estate and eventually the "trouble-making" son of the estate chef. There's a pretty good adventure in this story. Maria finds herself consumed with uncovering the hidden story behind various clues that seem to point to a pirate and his treasure having a connection to the estate. She learns to do for herself in a lot of ways throughout the course of the story, from how to ride a bike and sail, to how to decide for herself about the goodness of people. Maria's growth is central to this story, as she has always been the sort to withdraw from what surrounds her for self-protection in the Bronx. She learns to take risks, trust people, and even take charge in adverse situations. While she never turns into the leader on people all around her, she does affect for change in a lot of good ways through subtlety and seemingly small gestures. Maria and her single mother live in the Bronx. Her mother must work very hard to make ends meet, and Maria is often alone. This isn't too bad until the mean girls in her school target her. This is the impetus her mother needs to leave the city. She gets a job taking care of an elderly, infirm gentleman, Mr. Ironwall, on Martha's Vineyard. The two are given a small, cozy house, and the housekeeper brings them pans of sweet rolls and picnic lunches. Concerned that Maria won't have anything to do, she is given the responsibility of walking Mr. Ironwall's dog. She meets the housekeeper's son, Paolo, and the two decide that they will fix up a boat that Mr. Ironwall has left dormant. They hope that this will encourage the gentleman to get out of bed and not worsen and die, leaving everyone whose job depends on him "high and dry". Maria also finds some clues in the attic of the small house that leads her to believe that there is the titular treasure to be found, and she and Paolo try to find it. Strengths: So many good descriptions of houses, food, and family. Paolo's grandmother and grandfather are so appealing! I would have adored this as a child-- let me walk the dog! Let me befriend the old man who worked in Hollywood! Pure wish fulfillment all over the place. The other thing that I very much enjoyed was the interweaving of people's ethnic backgrounds. Maria's mother is Lebanese, and cooks a lot of Lebanese food, and sprinkles words into her conversation. Part of Paolo's family is Brazilian, but his grandparents are long time islanders. This was part of the family, and just casually described, but in such a warm and delightful way that it just made the families have more depth and personality. Well done. Weaknesses: This had an odd beginning, with the mean girls. Although I liked the older shop keeper who helped out the family, I kept waiting for the other shoe to drop-- I knew they wouldn't be there long. What I really think: This won't be a super popular book, but will be a big hit with the right reader. Twelve-year-old Maria lives in the Bronx with her Lebanese mother who works two nursing jobs, often working 12 hours a day for six days a week. Maria keeps her worries to herself for the most part, but she has no friends in school and is always picked on by the "Barbies". One day, when she is on her way to school, they trash her project and push her around. When her mom finds out, she gets a new job in the country and moves them both to a cottage. Maria first thinks that she will make no friends Twelve-year-old Maria lives in the Bronx with her Lebanese mother who works two nursing jobs, often working 12 hours a day for six days a week. Maria keeps her worries to herself for the most part, but she has no friends in school and is always picked on by the "Barbies". One day, when she is on her way to school, they trash her project and push her around. When her mom finds out, she gets a new job in the country and moves them both to a cottage. Maria first thinks that she will make no friends, but then she befriends the lonely son of the housekeeper. Then, she finds a mysterious map in the cottage where she lives, and she decides to solve the mystery behind the map and Captain Jean Murdefer. This story won the Arab American Book Award this year, and I could see why as I read this book. Maria grew up with a mixture of cultures, and throughout the book, it was shown through words in Arabic. Besides that fact, the story was sweet even on its own. I enjoyed hearing about a girl and her mother having a close relationship, even though her mother worked long hours. Even while she and her friend Paulo try to solve the mystery, she still feels guilty for keeping the small secrets from her mother. This story is one that I wish was out when I was 12, as it definitely would have been one of my favorites at the time. It is still very enjoyable now, but I would have loved it even more when I was twelve and struggling to find diverse books for my age level. While this book was chosen not necessarily by me but the award it was granted, I devoured this book. It took only until this line "And though she did not look like a baboon, Maria Theresa Ramirez Mamoun was certainly not a beautiful princess." for me to fall in love with the narrative style of this story, it reminded me a lot of 'The Book Thief'. The name of this book along with the cover necessarily wouldn't entice kids in my library to read this, it will need recommendation to thrive. One I am While this book was chosen not necessarily by me but the award it was granted, I devoured this book. I thought the character and setting descriptions were great and I really started rooting for Maria! However, the details of sailing and sailing terms were a bit much for me, and I would have preferred a lot more adventure and a lot less build up. It felt like 95% of it was a build up so I felt a little let down by the hugely predictable ending. Also, the term “Bad Barbies” really got on my nerves. Overall I enjoyed this but it felt a bit long. Maria is a young girl who live sin the Bronx with a mother who works multiple jobs to try to keep the family able to live. This tells the story about how they then move to Martha's Vineyard, where Maria makes some cool discoveries many things that lead her to some adventures. The story was alright to read about but the illustrations added to help make her adventures visible and there to picture. Sometimes, a middle grade novel just hits the spot. This one tackles bullying, loss, illness, and family wrapped up in a hunt for pirate treasure. The setting of Martha’s Vineyard made me pine for the beaches of New England. I enjoyed it. Recommended for those seeking adventure! Sweet story. Although some aspects are unbelievable, such as the very happy ending and her near intuitive knowledge of sailing, the relationships Maria has with her peers are realistic and therefore make the book relatable to its audience. Michelle Chalfoun enters the world of juvenile fiction with the heartwarming "The Treasure of Maria Mamoun." Readers looking for a feel-good summer story can pick up Maria's story without hesitating. Maria is a Lebanese girl living in the Bronx with her overworked mother, Celeste. Maria has a rough time at school, especially with a certain group of vicious bullies nicknamed The Bad Barbies. When things come to a head between Maria and The Barbies, Celeste realizes that things have to change for their family. Celeste quits her multiple nursing jobs and takes a new position caring for the ailing, exceptionally wealthy Mr. Ironwall on Martha's Vinyard. Maria and Celeste quickly settle in, but when Maria discovers a treasure map in the attic of her cottage and befriends trouble-making Paolo, an adventure unfolds and culminates in a dangerous treasure hunt. 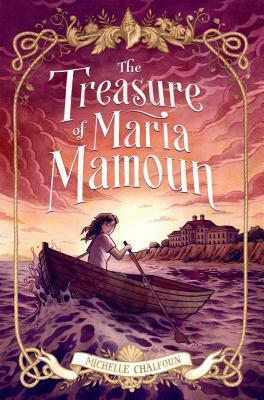 While readers will never truly fear for our heroine's safety, or the safety of those around her, "The Treasure of Maria Mamoun" will satisfy middle grade readers and advanced younger readers looking for a summer adventure. While not groundbreaking in story, it is wonderful to see a Lebanese girl take center stage in such an effortless way. Cultural notes are peppered throughout the story but never overtake the narrative. The relationship between Maria and her mother is quite believable, if a little rosy regarding the consequences of Maria's adventure. The resolution of the tale may be too pat for some readers, but this shouldn't affect the enjoyment of the story as a whole. Pick up Maria's tale for a warm and satisfying summer read. Maria and her mother live in the Bronx. Celeste has to work two jobs and Maria is home alone a lot. One day she can't avoid the mean girls at her school and Celeste decides things have to change. She takes a job taking care of Mr. Ironwell, a rich invalid on Martha's Vineyard. Maria and Celeste are given the cottage on the property to live in and Maria is given the responsibility of walking Mr. Ironwell's dog. While exploring the cottage, Maria finds a treasure map that she thinks will lead to a Maria and her mother live in the Bronx. Celeste has to work two jobs and Maria is home alone a lot. One day she can't avoid the mean girls at her school and Celeste decides things have to change. She takes a job taking care of Mr. Ironwell, a rich invalid on Martha's Vineyard. Maria and Celeste are given the cottage on the property to live in and Maria is given the responsibility of walking Mr. Ironwell's dog. While exploring the cottage, Maria finds a treasure map that she thinks will lead to an actual treasure. She enlists the help of the housekeepers son Paolo to help her fix Mr. Ironwell's sailing boat and find the treasure. She has also become close with Mr. Ironwell and wants to convince him not to give up on life and not to leave everyone who depends on him "high and dry". I quite enjoyed this story. I thought the relationship between Maria and Celeste was a wonderful one. They are completely on their own in the world with no family except each other and have to make do. They create a family with those around them who they can depend on. I also thought Mr. Ironwell was an interesting character. An old Hollywood icon who had been forgotten and who had really given up on life locked away in his mansion with only his housekeeper and nurses for company. I liked the relationship that developed between Maria and Mr. Ironwell and how that relationship changed both of them for the better. The treasure hunt added a bit of excitement to the story, but really this is a story about relationships and family. Thanks to NetGalley for providing me with an ARC of this book. Excellent adventure/mystery read for middle grade children! Hidden treasure maps, pirate ships, a mysterious mansion. What more could you want? Maria Mamoun doesn't know how much more she can take of the Bad Barbies, a group of girl bullies intent on making her life miserable. When they finally go too far, Maria's mom, Celeste, takes a new job caring for a bedridden man on Martha's Vineyard. With the bullies far behind her, Maria begi Thanks to NetGalley for providing me with an ARC of this book. Maria Mamoun doesn't know how much more she can take of the Bad Barbies, a group of girl bullies intent on making her life miserable. When they finally go too far, Maria's mom, Celeste, takes a new job caring for a bedridden man on Martha's Vineyard. With the bullies far behind her, Maria begins the adventure of her life. This was a very charming story about a girl from the Bronx who moves to Martha's Vineyard and engages in a bit of a historical mystery of the island. Maria, the main character, is eager to learn more and take on new challenges that she missed out on being alone and by herself in the city. I am not sure how one would use this for social studies instruction, but I think it's a great book for middle schoolers to have in a classroom library. I loved learning about the inside of Maria's heritage as she interfaced with the typical challenges of moving suddenly as a child. The new place (Nantucket Island) brings a mystery to be solved, friends to be mad, and challenges to be overcome. I received a copy of this book from Macmillan Children's Publishing Group via NetGalley in exchange for an honest review. A good story but needed more of the adventure and less of the build up.